Harvard Business School Press, 9781422183939, 222pp. People are drawn to and influenced by leaders who communicate authentically, connect easily with people, and have immediate impact. So how do you become one of them? 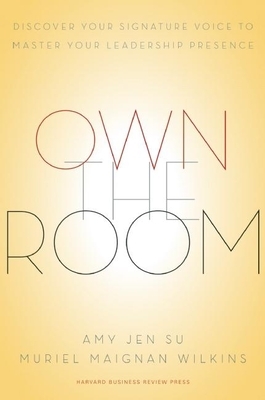 How can you learn to "own the room"? This book will help you develop your leadership presence. No matter where you sit in an organization, you can "own the room" if you are able to do two things well: first, demonstrate your authentic value and distinction, and second, connect to others in a positive way. Leaders who are able to be authentic while connecting with and impacting others have what the authors call a "signature voice"--a means of self-expression that is uniquely and distinctly their own. Once you discover and express your own signature voice, you'll be ready to take your leadership presence to the next level. Filled with real-life stories and examples, Own the Room demystifies the concept of presence and gives you the tools you need to identify and embrace your unique leadership voice--and have a greater impact on the world around you. Amy Jen Su is managing partner and cofounder of Isis Associates, an executive training and coaching firm. She is a frequently sought-after executive coach and speaker on issues of leadership presence, communications excellence, and executive endurance--factors critical to a leader's performance success. She has a proven track record helping senior leaders clearly articulate their personal and organizational vision, maintain their personal best amid change and complexity, and influence key constituencies. Muriel Maignan Wilkins is managing partner and cofounder of Isis Associates. Muriel is an executive coach, a strategy expert, and a frequent speaker on issues of leadership communication. She specializes in helping leaders develop in the areas of executive presence, role transitions, and relationship management. She has served senior-level clients across a number of industries including management consulting, private equity, biotech, and financial services. Muriel was recognized by the Washington Business Journal as one of the metro-DC area's "Top Minority Business Leaders."